After four weeks at No. 1, the Saints have been usurped by the former No. 1 Rams, who've won three straight since losing in New Orleans. But Los Angeles hasn't been nearly as good against the spread, getting its first cover since Oct. 21 with a 30-16 win in Detroit on Sunday. After four weeks at No. 1, the Saints have been usurped by the former No. 1 Rams, who've won three straight since losing in New Orleans. But Los Angeles hasn't been nearly as good against the spread, getting its first cover since Oct. 21 with a 30-16 win in Detroit on Sunday. The Rams [are on a 2-5-2 stretch](http://www.vegasinsider.com/nfl/teams/team-page.cfm/team/rams) ATS, including 2-3 on the road, and they're down to a three-point favorite (from -4.5 when it opened) [Sunday night in Chicago](https://www.betchicago.com/nfl-week-14-opening-lines-bears-dreams-of-rams-upset-ride-with-trubisky) as of Tuesday afternoon. 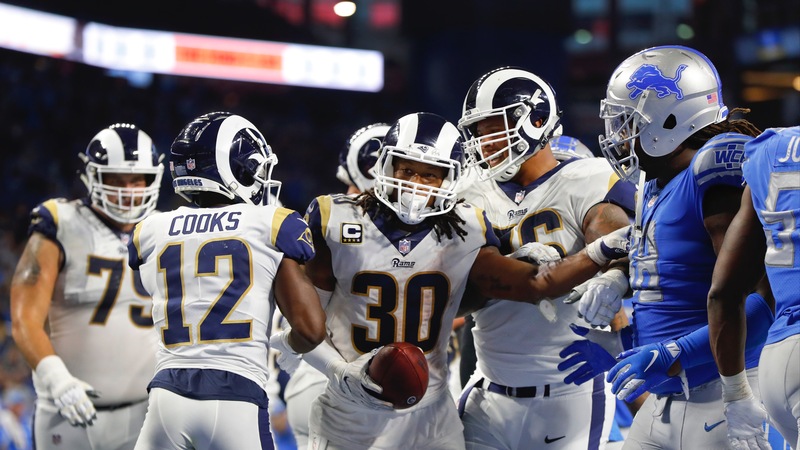 Los Angeles, which is a 5/2 favorite to win the Super Bowl as of Tuesday at the Westgate Las Vegas SuperBook, clinched the NFC West title for the second straight year but can secure a first-round bye in the playoffs [for the first time since 2003](https://www.pro-football-reference.com/teams/ram/index.htm) with a win over the Bears. The Rams are a game up on the Saints, who had their 10-game winning streak (nine straight covers) snapped with a Thursday night loss in Dallas. But New Orleans holds the tiebreaker thanks to their head-to-head victory. L.A. and the Saints remain in our favorites category, along with the Chiefs, though Kansas City has shown some signs of trouble, on a 1-3-1 stretch ATS and [now without Kareem Hunt](https://www.betchicago.com/%20chiefs-odds-kareem-hunt-betting-line-raiders). In case you've forgotten [from the last few weeks](https://www.betchicago.com/nfl-week-13-power-rankings-texans-remarkable-turnaround), we've been splitting the 32 teams into five categories -- favorites, Championship Game contenders, playoff contenders, playoff longshots and the dreaded [pit of misery](https://www.youtube.com/watch?v=I2MOimXE69s). But before we delve into this week's rankings, just a quick reminder to play our [free NFL Thursday Night Kickoff game](https://betchicago.chalkline.com/games/tnf-challenge?external_referrer=https%3A%2F%2Fwww.betchicago.com%2F). Correctly answer four props related to Thursday's Jaguars at Titans matchup to win a BetChicago prize pack. [__Bears disappointment against Giants presents new challenge__](https://www.betchicago.com/bears-disappointment-giants-new-challenge) | [__Who's the next coach to be fired after the Packers canned Mike McCarthy?__](https://www.betchicago.com/packers-coach-mike-mccarthy-fired-nfl-coach-fired-futures) | [__NFL playoff picture/Super Bowl odds__](https://www.betchicago.com/super-bowl-53-odds-betting-lines-playoff-picture-chiefs-kareem-hunt) ## NFL Week 14 power rankings *odds courtesy of the Westgate Las Vegas SuperBook as of Tuesday __The Favorites__ __1. Rams (11-1; 5-5-2 ATS; 5/2 to win Super Bowl)__; [last week: 2](https://www.betchicago.com/nfl-week-13-power-rankings-texans-remarkable-turnaround); -3 at Bears (Sunday night) -- They covered their biggest road spread of the season, but [only after Todd Gurley nearly cost bettors for the second time this season](https://ftw.usatoday.com/2018/12/todd-gurley-turns-down-td-touchdown-fantasy-gambling-reaction-video-rams-lions-packers-nfl). They'll play what'll likely be [their coldest game of the season Sunday night](https://weather.com/weather/tenday/l/USIL0225:1:US), but it still remains to be seen if Mitchell Trubisky will be back, or if they'll get backup Chase Daniel, who threw two picks in Sunday's loss to the Giants. __2. Saints (10-2; 9-3 ATS; 3/1 to win Super Bowl__; last week: 2; -8 at Buccaneers -- Tough spot Thursday in Dallas against a surging team fighting for the NFC East crown, but it was disconcerting to see them only put up 10 points after averaging 37 per game going into the game. They had a chance to clinch the NFC South with a win, but they'll get another opportunity this week in Tampa, a place they've lost each of the last two seasons. The 13-10 loss to the Cowboys was their first time since Week 2 failing to cover a spread. __3. Chiefs (10-2; 8-3-1 ATS; 9/2 to win Super Bowl)__; last week: 3; -6.5 vs. Ravens -- They're still in a dogfight with the Chargers for the division, and things are in a bit of turmoil right now, with Hunt situation, plus a defense that's yielded 84 points to the Rams and Raiders the last two games. Now on a 1-3-1 stretch ATS, the spread for their game against Baltimore opened at -9 and has been declining ever since. __Championship Game Contenders__ __4. Patriots (9-3; 8-4 ATS; 5/1 to win Super Bowl)__; last week: 4; -7.5 at Dolphins -- They can clinch the AFC East with a win, but they haven't been great on the road (3-3 SU and ATS) and they've lost four of their last five in Miami, prompting this line to come down dramatically from -10. And while Tom Brady and the offense generally get most of the credit, it's been the defense that's been their winning formula, as the UNDER has cashed in five straight games, in which they are 4-1. They've allowed 17 points or less in all four wins. __5. Texans (9-3; 6-6 ATS; 14/1 to win Super Bowl)__; last week: 5; -4.5 vs. Colts -- The train keeps on rolling, and now it's a profitable one, with the Texans on a 5-1 stretch ATS. Their nine-game winning streak began with a 37-34 victory in Indianapolis, and now the Colts get a chance to exact revenge with the Texans able to clinch the AFC South with a win and a Titans loss Thursday night. __6. Chargers (9-3; 6-5 ATS; 9/1 to win Super Bowl)__; last week: 7; -14 vs. Bengals -- Proving they can win a primetime game on the road will be big for their playoff confidence and it stamped them as an AFC title-game contender. They had beaten only one team (Seattle) that currently has a winning record before coming back from a 23-7 halftime deficit against the Steelers. They've also covered the spread in four of their last five and six of eight. __7. Cowboys (7-5; 7-5 ATS; 30/1 to win Super Bowl)__; last week: 9; -3.5 vs. Eagles -- Just a fantastic turnaround after a 3-5 first half, with four wins SU and ATS to get Jason Garrett off the hot seat for the time being. They seem like a good bet to host a first-round playoff game, and it's largely thanks due their defense, which is allowing only 18 points per game during its win streak. __8. Bears (8-4; 8-4 ATS; 20/1 to win Super Bowl)__; last week: 6; +3 vs. Rams (Sunday night) -- The trap game in New York got them, but it sure was entertaining, coming back from 10 points down with less than two minutes to play to force overtime. Chase Daniel has kept them competitive, but there's a reason why he's Mitch Trubisky's backup. Sunday's game will be tough, but the rest of the schedule -- vs. GB, at SF and at MIN -- is manageable. __MORE:__ [Chase Daniel proves Matt Nagy, Bears front office is savvy](https://www.betchicago.com/chase-daniel-matt-nagy-bears-front-office) __9. Steelers (7-4-1; 6-5-1 ATS; 12/1 to win Super Bowl)__; last week: 8; -11 at Raiders -- Another game they had no business losing, their second such game in a row. They still have the AFC North lead, but only barely over the surging Ravens. They better win this week, because then they get the Patriots at home before a trip to New Orleans. Getting to 10 wins is going to be a struggle for this team. __Playoff Contenders__ __10. Seahawks (7-5; 7-3-2 ATS; 40/1 to win Super Bowl)__; last week: 11; -3.5 vs. Vikings (Monday) -- Four of their five losses have come against teams we've already mentioned and the other was a three-point loss Week 1 in Denver, so they've really only lost to the cream of the crop. They're not going to win the division, but they'll be a tough out for either Dallas or Chicago in the first round because of their pedigree. They're also on a 6-1-1 stretch ATS. __11. Ravens (7-5; 6-6 ATS; 40/1 to win Super Bowl)__; last week: 12; +6.5 at Chiefs -- Lamar Jackson is 3-0 as a starter but all three games were against teams with losing records. That won't be the case Sunday in Kansas City, where it should be cold, and Jackson will be facing an even more dynamic quarterback in Patrick Mahomes. Based on the way the spread is moving, people believe in the rookie, but this will be his toughest test to date. Their Super Bowl odds went from 100/1 to 40/1 this past week. __12. [Eagles](https://www.betchicago.com/eagles-defeat-redskins-28-13-cover-spread-6-point-favorites) (6-6; 4-8 ATS; 60/1 to win Super Bowl)__; last week: 16; +3.5 at Cowboys -- After being in the pit of misery only a few short weeks ago, they have a chance to join Dallas atop the NFC East with a win Sunday. It won't be easy, as the Cowboys beat them by seven in Philly on Nov. 11 to start a four-game winning streak. A loss basically ends their playoff hopes with a trip to the Rams and home game against the Texans upcoming. __13. Broncos (6-6; 6-5-1 ATS; 100/1 to win Super Bowl)__; last week: 17; -5.5 at 49ers -- Another team back from the pit of misery behind three straight wins, and the rest of the schedule is favorable, to say the least (at SF, vs. CLE, at OAK and vs. LAC, who might be clinched at that point). And after starting the season 0-4-1 ATS, they're on a 6-1 ATS run as the weather starts to turn in the Rockies -- just how they like it. __14. Vikings (6-5-1; 6-5-1 ATS; 40/1 to win Super Bowl)__; last week: 10; +3.5 at Seahawks (Monday) -- You guys hear that? It's the trend police, here to warn you they've failed to cover their last three games as an underdog, but did cover their last four as a favorite. Doesn't bode well for Monday night in the Great Northwest. __Playoff Longshots__ __15. Colts (6-6; 5-6-1 ATS; 200/1 to win Super Bowl)__; last week: 13; +4.5 at Texans -- They're five-game winning streak was bound to end sooner or later, but it came in pretty ugly fashion. Sunday's 6-0 loss in Jacksonville was the first time Andrew Luck has been shut out in his career. They have a tough closing stretch, with home games against the Cowboys and Giants after their first to Houston, followed by a road game in Tennessee. __16. Dolphins (6-6; 7-5 ATS; 500/1 to win Super Bowl)__; last week: NR; +7.5 vs. Patriots -- So they're 4-3 SU and 5-2 ATS with Ryan Tannehill as their starting quarterback, but only 2-3 SU and ATS with Brock Osweiler. That's been the difference this season. __17. Titans (6-6; 6-6 ATS; 200/1 to win Super Bowl)__; last week: NR; -4 vs. Jaguars (Thursday) -- Their comeback from 16 points down against the Jets kept them alive in the playoff hunt another week, but [a loss Thursday to the Jags](https://www.betchicago.com/nfl-survivor-picks-week-14-titans-jaguars) probably puts the nail in the coffin. They've lost three straight ATS after covering the spread in three straight. They finish with three games in Nashville out of their last four. __18. Redskins (6-6; 7-5 ATS; 1000/1 to win Super Bowl)__; last week: 14; +3.5 vs. Giants -- First, Alex Smith. Now, Colt McCoy. Onto Mark Sanchez. Uh oh. __19. Panthers (6-6; 5-7 ATS; 200/1 to win Super Bowl)__; last week: 15; -1.5 at Browns -- Last week I said they were the worst team with a winning record in a while. Well, that problem got solved with their fourth straight loss SU and ATS, a 24-17 decision in Tampa. Ron Rivera is on thin ice with an L this weekend in Cleveland. [__The Pit Of Misery__](https://www.youtube.com/watch?v=I2MOimXE69s) (in alphabetical order). (Deletions: Titans, Dolphins; Additions: None). __Bills (4-8; 5-7 ATS; 10000/1 to win Super Bowl)__; last week: NR; -3.5 vs. Jets -- They had a fourth-quarter lead in Miami, but couldn't hold on for their first three-game winning streak in two years. Jets up next, so maybe time to start another one. __Bengals (5-7; 5-7 ATS; 2000/1 to win Super Bowl)__; last week: NR; +14 at Chargers -- I guess Jeff Driskel wasn't a complete atrocity, but they still managed only 10 points. Don't expect much more this week against the Chargers. __Browns (4-7-1; 7-5 ATS; 2000/1 to win Super Bowl)__; last week: NR; +1.5 vs. Panthers -- Can we pump the brakes on fitting Baker Mayfield for a Hall of Fame jacket? Three picks against a real defense has sent him crashing back down to earth. __Bucs (5-7; 6-6-1 ATS; 1000/1 to win Super Bowl)__; last week: NR; +8 vs. Saints -- If they beat the Saints, we'll have to remove them from the pit. They have a tough finishing stretch -- at BAL, at DAL and vs. ATL -- after New Orleans. __Cardinals (3-9; 6-6 ATS; No Super Bowl odds because they're eliminated from playoff contention)__; last week: NR; +2.5 vs. Lions -- What was the more inexplicable victory this season, the Bills dominating the Vikings in Minnesota or the Cards winning in Green Bay with the Packers' playoff hopes on the line? __Falcons (4-8; 3-9 ATS; 1000/1 to win Super Bowl)__; last week: NR; +5.5 at Packers -- Four straight losses SU and ATS and four straight UNDERs. It can't be long until Dan Quinn is fired, right? __49ers (2-10; 3-9 ATS; Eliminated)__; last week: NR; +5.5 vs. Broncos -- We'll see if they've officially given up on Sunday. My guess is yes. __Giants (4-8; 6-5-1 ATS; 1000/1 to win Super Bowl)__; last week: NR; -3.5 at Redskins -- They've been profitable (4-1-1 ATS run), but let's not delusional (like some Giants fans) thinking they can make a push for the division. __Jaguars (4-8; 4-6-2 ATS; 2000/1 to win Super Bowl)__; last week: NR; +4 at Titans (Thursday) -- Covered the spread for the first time since Sept. 30. Where the heck has that defense been all season? __Jets (3-9; 4-8 ATS; Eliminated)__; last week: NR; +3.5 at Bills -- Welcome to the ranks of the eliminated. Todd Bowles is on borrowed time. __Lions (4-8; 6-6 ATS; 1000/1 to win Super Bowl)__; last week: NR; -2.5 at Cardinals -- Be careful betting them this week, even though they covered their only game as a road favorite (32-21 laying three in Miami), as they're on a 1-5 run ATS. __Packers (4-7-1; 4-7-1 ATS; 200/1 to win Super Bowl)__; last week: NR; -5.5 vs. Falcons -- When you're nearly a two-touchdown favorite at home and you lose outright, it's time [to change coaches](https://www.betchicago.com/josh-mcdaniels-favorite-packers-head-coach). And they did. __Raiders (2-10; 4-8 ATS; Eliminated)__; last week: NR; +11 vs. Steelers -- It could be the spreads are getting a bit too large. They're professionals, too ... sort of.